A massive tornado barreled through central Arkansas on Sunday, killing at least four people and injuring several others as it left behind a 30-mile path of destruction. 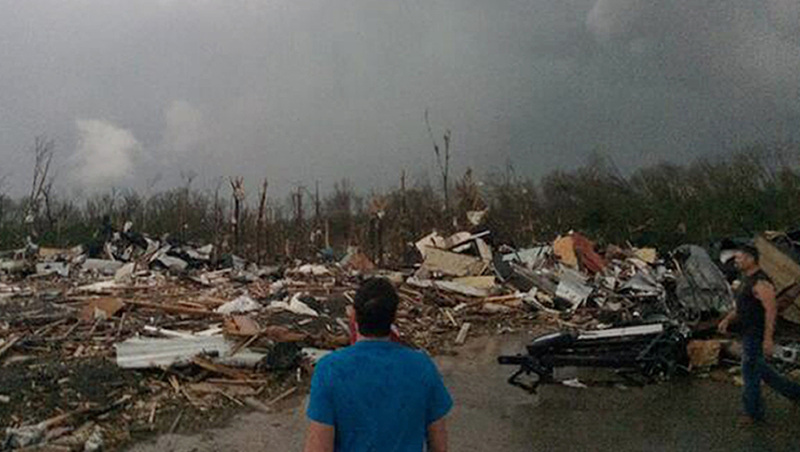 Twisters also caused extensive damage in Oklahoma, where one person was killed, and in Kansas. The tornadoes were spawned by a powerful storm system that rumbled through parts of the Midwest and South on Sunday. The Arkansas tornado touched down about 10 miles west of Little Rock at around 7 p.m. and moved northeastward for at least 30 miles, the National Weather Service said. It missed the state capital but passed through or near several of its suburbs, causing widespread damage in the communities of Mayflower and Vilonia. At least four people were killed. Matt DeCample, a spokesman for Gov. Mike Beebe, said three of the deaths were in Pulaski County and the fourth was in White County. Several injuries were reported and authorities feared the death toll could climb higher. In Oklahoma, one person was killed after a tornado hit the small town of Quapaw on Sunday, officials said. Authorities initially said two people were killed but later revised the number. Emergency management director Joe Dan Morgan said the north side of town was hit hard and that a fire station had been destroyed. "Looks like about half of town got extensive damage as well as the fire department," Morgan said. Quapaw is located about 20 miles southwest of Joplin, Mo., where a massive tornado in May 2011 killed 161 people. Sunday's tornado did not touch down in Joplin. After hitting Quapaw, the twister continued northward into Kansas and struck Baxter Springs, about 5 miles away, Morgan said. The Kansas Division of Emergency Management said preliminary reports indicated as many as 70 homes and 25 businesses in Baxter Springs had been destroyed. Cherokee County, Kan., sheriff's dispatcher Josh Harvey several people were injured but no deaths had been reported. He said first responders were going from house to house checking on the community's roughly 4,200 residents. The nation's first tornado death of 2014 occurred Sunday in North Carolina, where an 11-month-old boy died of injuries suffered Friday when a twister sent the roof crashing down on his home in Edenton in Chowan County in the eastern part of the state, CBS affiliate WNCT reported. Forecasters had warned people to be alert Sunday for possible tornadoes in a wide swath of the Midwest and South, stretching from Omaha, Neb., south to Texas and east to northern Louisiana and Mississippi. The first reported tornado from the storm system touched down Sunday afternoon in a rural area in central in Nebraska. The National Weather Service said it remained on the ground for only a short time, and there were no immediate reports of damage. Tornado watches - which means twisters could develop but aren't an immediate threat - were widespread across the Midwest and Southern states Sunday, being issued in Kansas, Missouri, Mississippi, Nebraska, Iowa, Arkansas, Oklahoma, Texas and Louisiana. Areas that don't get tornadoes could still get buffeted by hail and powerful straight-line winds. Forecasters warned of hail stones as big as baseballs and wind gusts that could reach hurricane-force - 75 mph or higher. Gusts of up to 60 mph were registered during a story that hit southeastern Iowa on Sunday that damaged several buildings, including a barn that injured someone when it was blown over.